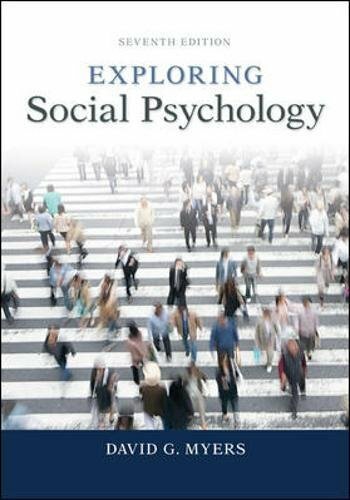 77825454 –Exploring Social Psychology succinctly explores social psychological science and applies it to contemporary issues and everyday life. Based on the bestselling text, Social Psychology by David Myers, the book presents 31 short modules – each readable in a single sitting – that introduce students to such scientific explorations as love and hate, conformity and independence, prejudice and helping, and persuasion and self – determination. • SmartBook® – an adaptive digital version of the course textbook that personalizes your reading experience based on how well you are learning the content. • Access to your instructor’s homework assignments, quizzes, syllabus, notes, reminders, and other important files for the course. • Progress dashboards that quickly show how you are performing on your assignments and tips for improvement. • The option to purchase (for a small fee) a print version of the book. This binder-ready, loose-leaf version includes free shipping. download our App to find cheap textbooks new and used with Low Price Books for Android ! Shop in store but buy through Low Price Books!